*There are no holes or rips in the material. *The fabric is not faded or stained from use. *There is some hair on material, that should wash right out. 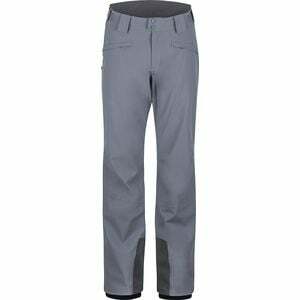 Your days of straight tucking through GS gates may be over, but that doesn't mean you can't enjoy the versatility and performance of the Marmot Doubletuck Shell Pant. Offering full waterproof protection and lightweight insulation, the Doubletuck is a trusted partner for everything from cold early-morning backcountry ascents to long days at your favorite resort. Marmot's waterproof and breathable MemBrain technology keeps you dry and won't pack heat during huge powder dumps, while the lightweight and low-bulk Thermal R insulation gives you that extra boost of warmth that'll help you shred bell-to-bell on frigid days. When you're cutting deep powder turns you'll have ankle gaiters keeping the snow from flying up your boots and scuff guards at the cuffs to resist wear and tear through tight tree runs and long backcountry bootpacks.